If you've decided to separate a larger room into two--say, to add a closet or a playroom--the best choice would be to build a stud wall. It's not a complicated project, so you can actually do it yourself. While an exterior wall is made of hard, strong material, like brick or concrete blocks, an interior stud wall is made of wooden studs and 1/2-inch plasterboard. 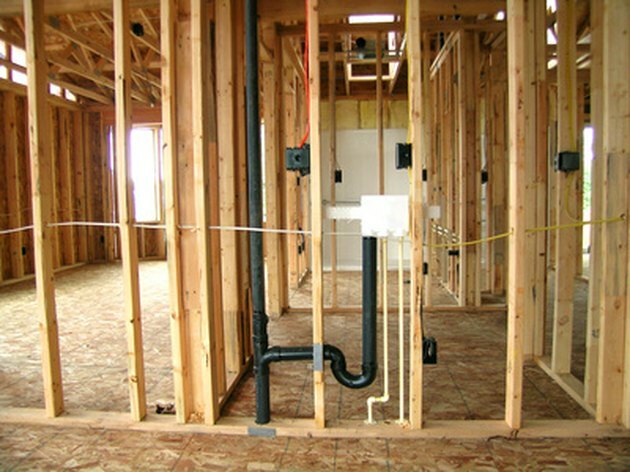 Interior walls can go either partially or all the way across an existing room. If it's to go from wall to wall, a doorway or walkway is obviously needed and will have to be framed into the new wall before plasterboard is attached. Adding an interior wall is a project you can do yourself. Measure the distance from one corner of the room, along the wall, to the desired location of the new wall, marking a point on the ceiling close to the wall. Then measure the same distance from the other room corner, marking the ceiling on that side. This will ensure that the new wall is perpendicular to the existing walls. Hold a stud up to the ceiling with one side resting on the two markings, and run a pencil along both sides of the stud so you have two parallel lines. Cut two studs the required length of the new wall with a power saw. These two studs will eventually be nailed to the ceiling and the floor, and be parallel with each other. Choose whether the new wall to go all the way from one existing wall to the opposite existing wall, or only a portion of the way across. Place the studs side-by-side, and on both studs mark the two ends the width of one stud (roughly 1-3/4 inches in from the end). Then, from the stud's end, mark along the studs at 16-inch intervals. Find the roof joists with a stud finder. Nail one stud to the ceiling with 16d nails and your hammer, making sure the nails sink into the roof joists. The pencil marks should be facing down. Use two nails per roof joist. Hang a plumb bob at one end of the ceiling stud and mark the floor where it rests. Do the same at the other end of the ceiling stud. Draw a straight line between the two markings. Making sure the pencil markings face up, rest the second stud on the floor with one edge on the line. Nail the stud to the floor with two 16d nails every 16 inches. If a doorway or walkway is needed, choose the location in the new wall and frame with studs around the doorway/walkway perimeter. It's best to run two vertical studs from floor to ceiling on either side of the doorway, connecting them with 16d nails to the ceiling and floor studs. Then insert a horizontal stud (cut to size) between the two vertical studs at the required height of the doorway/walkway, connecting it with 16d nails to the two vertical studs. Measure the distance between the ceiling and floor studs, adding 1/8 inch for a snug fit. Cut a stud to this length and position it vertically so its center rests on the 16 inch markings. Use a hammer to knock it into place. Toenail--nail from the side at a 45 degree angle--the stud to the ceiling and floor studs. Cut and nail all the remaining studs into position. Hang the plasterboard vertically on one side of the new wall. Start on either side where the new wall meets the old wall, and work across the new wall until you reach the other end. Use 1-3/8-inch standard size nails, and nail the studs every 10 inches. Now hang plasterboard on the other side of the new wall, repeating these steps. If the new wall only goes partially across the room, plasterboard the end also. This will obviously be a thin strip the height of the room, and roughly 4-1/2 inches wide. Apply corner bead--a metal or vinyl strip that will give the corner a perfectly finished look--to each corner with plasterboard nails, from floor to ceiling. If an entryway has been framed, follow the same steps in applying plasterboard and corner bead around the entryway frame. However, if a door is to be inserted, there is no need to plasterboard the doorway frame as it will be covered by the door jam (wooden structure surrounding the door). Run joint tape along all the plasterboard joints. It's best to use the plastic mesh variety as it is sticky on one side and easily sticks to the joins. Then apply the joint compound over the tape with a 6-inch plasterboard knife. If using corner bead, apply joint compound over that also. Wait for it to dry--usually overnight--before sanding and adding a second coat. Allow to dry and sand again to create a smooth finish.